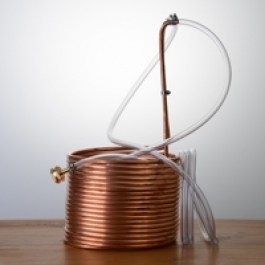 This immersion style wort chiller is made from 50′ of ⅜″ diameter copper tubing. The chiller is just 9″ wide, so it fits easily in smaller brewing vessels. Two, 5′ vinyl tubing attachments are included for cold water input and warm water outflow. The cold water vinyl tubing terminates with a female garden hose thread (GHT) fitting that will attach to standard garden hose faucets and most utility sinks.